FT-736R - FTS-8px CTCSS encoder / decode module installation 28 May 2016.. Installation of a CTCSS encoder / decode module. The FTS-8px CTCSS is a direct substitute for the Yaesu FTS-8 unit that has long been out of production. 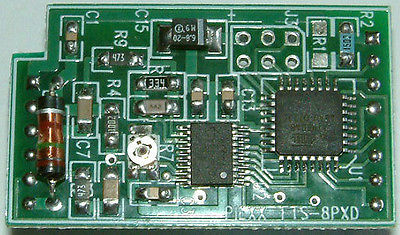 The substitute FTS-8px module was purchased from Piexx Company https://www.piexx.com/. The Piexx Company encoder / decode is a direct drop in replacement for the original Yaesu FTS-8 unit. This tone board was used in quite a range of Yaesu transceivers including the FT-736, FT2700RH, FT-2270R, FT-770, FT-767, FT-650 and others. Photo#1 The Piexx Company FTS-8px CTCSS encoder / decode module. Photo#2 FT-736R transceiver with front panel hinged open. The red circle indicates the FTS-8 CTCSS encoder / decode module sockets. Photo#3 FTS-8 CTCSS encoder / decode module fitted (centre of photo).